BBQ Sauce For Brisket Recipes That Work Right Now! The hunt for the perfect brisket bbq sauce has never been as storied as the search for the monster of the blue lagoon. It seems every corner of the United States is famous for producing some sort of barbeque sauce and why not, the term bbq sauce, and barbecue sauce recipes are the highest searched terms in the world of barbecue. The bbq sauce term is so highly prized that companies who run Pay Per Click campaigns during the month of June through September 2018 pay vast sums just to be listed on the front page of Google’s BBQ sauce page. We at Jake's Famous Foods been building and selling BBQ Sauce and BBQ sauce recipes for the past 16 years now. And because we believe that everyone should have the freedom and choice to consume the brisket they've always wanted we've put together a collection of 10 of our most popular brisket bbq sauce recipes. Barbecue and bbq is very personal and when you invest time and energy into the process you want to ensure that the end result justifies the effort that went into the process. For this post we did not start out to put out long stories or discussions of wet versus dry barbecue sauce. Instead what we’ve done is collect 10 of the best BBQ Sauce Recipes we’ve ever made. And because you’re so nice…we’ve added in some Bonus brisket bbq sauce recipes that can be made with typical everyday kitchen ingredients. One thing that doesn't get enough attention is having a recipe that can be made with simple everyday ingredients. If you've got black pepper, salt, garlic and some form of syrup or tomato paste or ketchup you can make these recipes. So, next time you decide to barbecue brisket print or list the ingredients in one of these favorite recipes then build your bbq sauce from scratch. One thing we will also tell you is that each of these recipes is taken directly from sources in the region. We at Jake’s make natural products so some of the ingredients like whole bottle Ketchup and Corn Syrup you’ll never seen built into our recipes. Instead what you will see is our versions of these classic favorites that we sell everyday. Take for example our Ball Park Ketchup is a deconstructed version of that very famous brand Ketchup with a few major exceptions. The fact is we've taken out the controversial notes like Corn Syrup and chemical additives and instead have made our version gluten and MSG (Mono Sodium Glutamate) Free, you won't find those ingredients in our sauces. The result a cleaner, better tasting, more natural brand of Ketchup. And with that you'll be making a cleaner, better tasting bbq sauce recipe for you and your friends and family. While it seems no one can nail down the exact origins in which the first barbecue sauce was created we do have some historical data on when it was first sold. Many believe the first barbecue type sauce was created in the 15th century about the time that Christopher Columbus sailed the planet bringing back a multi spiced, liquid combination from Hispaniola. Others say the sauces were first collected in the 17th century somewhere in the American colonies. Jumping ahead the first commercially produced barbecue sauce was made by the Georgia Barbecue Sauce Company out of Atlanta and advertised in the Atlanta Constitution, January, 1909. Heinz released its first version of barbecue sauce in 1940 followed by Kraft who took the novel approach of producing spices and oils which could be combined together into bags. Regarding the appropriate use of barbecue, barbecue or barbque, we’ve found it all depends on where your from. In most cases barbecue, barbeque, and barbque all mean the same thing referencing the act of cooking and grilling while bbq, tends to reference a meal or event. The bbq sauce recipes we've included here as mentioned are regional style. The first in the styles is Memphis Style BBQ Sauce. What would life be like if Memphis Barbecue Sauce wasn’t invented? I think our taste buds would be the big losers if such a thing had ever happened. Memphis always reminds me of a creamy sauce blended with celery and garlic and a whole host of other fine ingredients. Carolina Style The richness of red and black pepper all blended together into a vinegary base is all you need to know about good Carolina BBQ Sauce. Smokehouse style Brisket BBQ Sauce One of my all-time favorites, a nice bite with a gentle sweetness that compliments almost any meat. Red Wine BBQ Sauce Rich wine tannins complement the fullness to tomatoes and brown Sugar. Asian Style BBQ Sauce -A fantastic blend utilizing soy, rice wine and ginger. Chicago Sweet Style Who can forget the flavors of Old Chicago. Subtle and bold all at the same time. 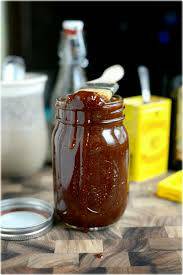 Kansas Style BBQ Sauce A wonderful sauce combined with savory butter, molasses, garlic, brown sugar and more. Texas Style Brisket BBQ Sauce Texas, it’s a whole other Barbeque Sauce. Southern Style BBQ Sauce Oftentimes people get the difference between Smokehouse Style and Southern Style confused. To a Barbeque Sauce aficionado they couldn’t be more different. Florida Style BBQ Sauce -Some of the best BBQ I’ve had in my travels was in Florida warm weather and afternoon rains. California Style BBQ Sauce We can’t leave out California. Many people say that California doesn’t have a style and that it is simply the blending of recipes from people and places like Oklahoma, Texas, Arkansas and Colorado. We believe California does have its own unique style. New Mexico Style BBQ Sauce Vast open spaces, large mild and hot Pasilla peppers and massive festivals Centered on all things hot and spicy. Louisiana Style BBQ Sauce From the land of Beignets, red beans and rice, Etoufee and King Cake. Note, there's been some conversation about brisket bbq sauce recipes with heat and what would be do to make these recipes have that special bite that so many people love. We can think of a couple of ways to add heat to your perfect bbq sauce recipe. One is the simple use of more black pepper. Just ratchet up the amount of black pepper by 2 or 3 times to drive up the spiciness of the bbq sauce recipe. The next way to drive up heat would be the addition of chili powder. Most people have some form of chili powder in their cupboards so the addition is fairly simple. And much like black pepper you would either bump up the amount in an existing recipe or make the addition of 1 tablespoon first then testing the blended sauce. Afterward if you still want more heat we suggest adding another tablespoon of chili powder. Now comes the fresh versions of heat. Let's consider the addition of green jalapeno peppers. These jalapenos add a nice burst of heat that can permeate the entire batch of sauce. One must be careful when adding jalapeno peppers. First, testing to ensure that the level of jalapeno is enough then ensuring that your hands are washed so as not to get the juices into your eyes or on your mouth. Start small and work up to the right amount before trying the sauce out on friends or family. We've found that 1/2 of a jalapeno is more than enough heat to drive up the spiciness in a bbq sauce recipe. Next come habanero peppers for increasing levels of heat. There are some pretty great Scoville scale charts out there to identify the exact level and types of heat desired. Habaneros can be daunting and must be balanced otherwise you can expect your bbq sauce to have a steady flow of heat and not much flavor. Blend the habanero with items like ginger or celery which are compliments but won't drive the heat and won't overpower the end result. If you're making the sauce for yourself then you can get some pretty audacious levels of heat. But be careful so that your friends are in the line of fire where heat is concerned especially if they only like mild bbq sauce. Blending Tips: When it comes to blending it's a good idea to start over low heat. 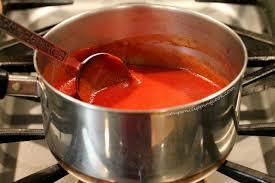 Allow the sauce to meld together stirring constantly until you've reached a uniform color. We like cooking the sauce for at least 15 minutes then pouring the sauce into a container. After the sauce is placed in a container allow the sauce to rest in the refrigerator for at least two hours minimum. This resting period will actually allow continued melding of the flavors and will create as we as in the business a nice level of maturity. Once rested serve of baste on at will. Here's a great video with instruction on make some popular bbq sauce recipes. View this short video that gets right at the heart of making some great bbq sauces for you, your friends and family. To help satisfy the bbq urge we’ve built a boat load of products that are on the market right now and available when you shop natural bbq sauce online and when your order bbq sauce online. Below we’ve listed our key seven dry rubs and our standing of natural BBQ sauces. These all represent our basic stable of natural bbq rubs and sauces for sale each perfect for their role in improving your brisket..
Now that you've received some pretty great brisket bbq sauce recipes we got some great deals for you on our SPECIALS PAGE you'll get 10% OFF pricing on our award winning dry rubs, sauces and seasonings. You'll Get that immediate 10% OFF when you use Jake's product savings Code: 1707200910 at checkout. We hope you’ve enjoyed these 10 Brisket BBQ Sauce Recipes. Also, we hope you’ve enjoyed the additional recipes we’ve provided. We believe the best brisket bbq sauce recipe is the one you use most. Take time to review each recipe then build and adjust to match your cooking Style. For More Brisket BBQ Sauce Recipes see the recipes on our BBQ Recipes page.